Always wishing and craving for that curly and bouncy hair that will turn heads everywhere you go? Well if your answer is yes, then a curling iron is just what you have been missing all this while, as the name implies it’s a curling iron, it does the trick and magic of curling your hair! BUYER BEWARE or in other words CAVEAT EMPTOR principle, it’s your duty and responsibility as a buyer to check the quality of the product before purchasing it, so no one will be blamed if you end up purchasing a low quality product, that’s why you need to be well informed of the ideal tool that you want before purchasing it, let it be worth your money! But with different variety and brands of curling irons available in the market, it’s so easy for one to fall prey for low quality products and also it might be confusing to know which tool is ideal for your hair type and which one is perfect for achieving the specific look that you want. Well no need to worry because this article is here to help and guide you to not only pick the best tool but also guide you on how to use the tool to achieve those elegant curls and beachy waves you have been dreaming of! The surface of your curling iron may be made out of either ceramic, tourmaline or titanium technology. So before you purchase a curling iron it is important that you know which material works best for the needs of your hair. You have to pick a curling iron which will be gentle on your hair and also the one which will ensure healthy hair. Ceramic technology ensures that heat is evenly distributed and also discharges negative ions into your hair and scalp thus keeping frizz at bay and also giving your hair a smooth and shinny look. The best thing about this technology is that you will not experience any pulling or snagging while curling your hair. The tourmaline iron on the other hand, emits more negative irons than the other technologies thus making it stand out from all the rest. It gives your hair a shinny smooth look. Lastly we have the titanium curling iron. This technology is well known for heating up extremely fast, so if you have coarse hair which is resistant to heat, then you should consider picking a curling iron with this kind of technology. It’s highly recommended to use the ceramic or tourmaline irons especially if you have damaged hair or if you want to maintain healthy hair. First of all you need to know that there are different sizes of curling irons available in the market, and each of them offers and delivers different kind of results depending on their size. So if you pick the wrong size the end results might turn out to be unlikable, that is why the size of the curling iron is vital when it comes to choosing the best iron for your hair. The size ranges from the 3/8 curling iron which is the smallest to a 2 sized curling iron which is the largest size of curling iron. You will have to pick the size that is most suitable for your hair depending on the length of your hair and the look that you want to achieve. The most common choice is the 1 sized curling iron, because it works well for both medium and short length hair. If you have short hair or you want to achieve ringlets, spirals and tight curls then you should go for a curling iron that is less than 1 inch, this can either be 3/8 or 5/8 inches, while those who want to achieve large and loose curls or have long hair should go for a curling iron which is more than 1.25 or more than 1.5 inches. The 2 inch sized curling iron always allows you to achieve that perfect round shaped bend at the ends of your hair. Always go for a curling iron that has variable temperature settings that will allow adjusting the heat depending on the type of your hair. Thick hair may work with high temperatures but thin hair may be badly damaged if exposed to high temperatures. If you have thin or fragile hair then you should ensure that the curling iron you are purchasing has been encompassed with an adjustable heat setting or have an LCD display to allow you operate with the lowest heat setting that is suitable for your hair. A curling iron with multiple heat setting is always considered the best for every hair type. 1500 is always considered suitable for thin, fragile and damaged hair, 1700 is suitable for fine and straight hair, while 2000 works for medium texture hair, and if you have lots of thick hair which is resistant to styling then you can adjust the heat setting above 2400 or the maximum temperature. Thick and unruly hair which is extremely resistant to styling? No need to worry if you have such kind of hair, because all you need to do is get yourself this ultimate curling iron and all your hair problems will be over! The size of this curling iron is perfect for long and medium length hair, allowing your hair to be fully wrapped around the iron making it easy for you to achieve gentle and voluminous curls. 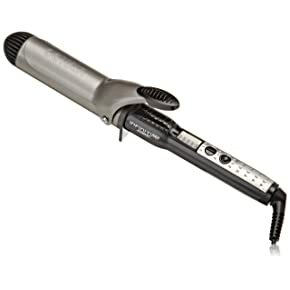 This iron has been encompassed with great technology which makes the barrel heat up so fast and also retains heat much longer thus making it appropriate to manage thick and coarse hair. This tool can also be use on other hair types since it has an adjustable temperature heat setting, but due to its outstanding feature of heating up extremely fast and retaining heat for a long time, makes it perfect for thick and coarse hair. More so it has a high temperature setting compared to other curling irons, making it possible to heat up thick and coarse hair. This tool has been approved as the best curling iron on the market by users, and if you are struggling with styling your thick hair, this is the ideal tool to deal with your unruly thick hair! Doesn’t have an auto shut-off feature. The tourmaline and ceramic technology encompassed in this curling iron is a great and perfect combo not only for ensuring long lasting curls but also for ensuring healthy hair, and the most amazing part of it is that you can get all this without spending too much money! Keep frizz at bay by getting yourself this extremely affordable and high quality tool on the market. With its’ unique technology which releases negative ions during the process of curling your hair, it helps to lock in the moisture in your hair giving it a smooth and shinny look throughout the day. 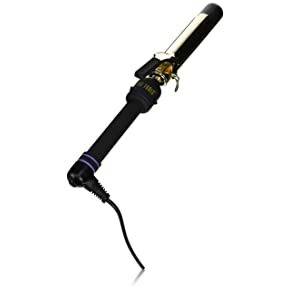 You do not have to worry about your hair being damaged from direct heat when it comes to this product, this is because the tourmaline and ceramic technology encompassed in this curling iron ensures even and fast distribution of heat during the process of curling your hair thus minimizing the time your hair is exposed to heat. More so the technology relieves your hair from static electricity thus preventing any heat damage on your hair. 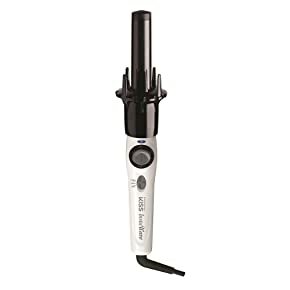 If you are looking to achieve those beachy waves with natural looking curls then this is the ideal tool for you, although I wouldn’t recommend this tool to people with fine and thin hair, because its’ temperature setting starts at 3100 which might a little bit high for fine or fragile hair. It’s a full package! If you are confused on which size of curling iron is perfect for your hair, then look no further because this curling iron is just what you need. 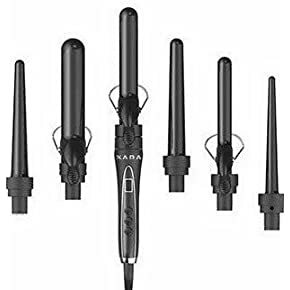 This curling iron comes in different sizes all in one set, allowing you to create variety of styles while making sure that your hair stays healthy due to its ceramic tourmaline technology. The most amazing part of it is that it works on all hair types! Long, medium or short length hair can easily and perfectly be styled by this curling iron; all you need to do is use the size that suits your hair. 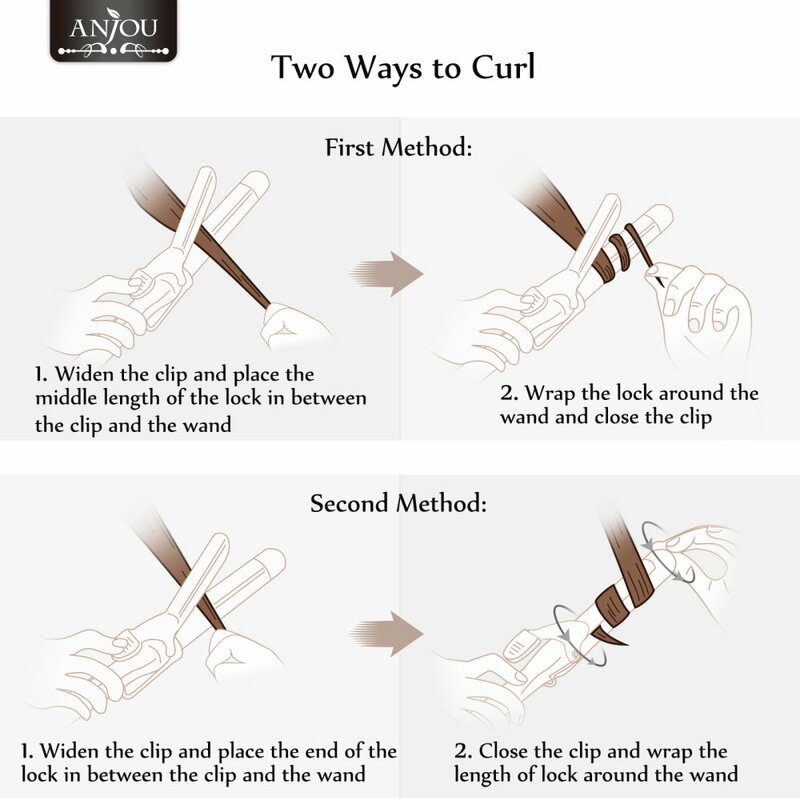 This tool allows you to swap on whichever size of barrel you want making it much easier to get curls with different sizes within few seconds. If you are looking to achieve tight curls, beachy waves, bouncy or voluminous curls, then this tool is ideal for you, since it allows you to switch to a different style whenever you want. And the wide range of temperature setting offered by this curling iron makes it possible to be used by all hair textures. People with thin hair can use the iron on low setting while those with thick hair can adjust the heat setting to medium or high temperature. If you are looking to create more defined and long lasting curls then this is the perfect tool for you! With the wide range of heat setting it allows one to adjust the temperature on low, medium or high temperature setting depending on the needs of your hair. This tool is perfect for thick and coarse hair since it has been encompassed with technology that heat up so fast and retains heat much longer making it easier for thick and coarse hair to curl especially when the heat has been adjusted to high temperature setting. 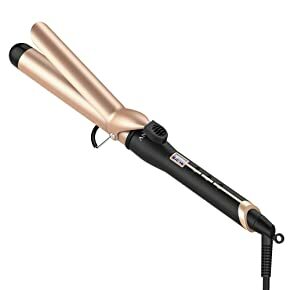 The titanium ceramic technology encompassed in this curling iron ensure fast and even distribution of heat during the curling process, minimizing the time your hair is exposed to heat thus preventing any heat damage. More so the technology prevents frizz by releasing ions to your hair which also makes your hair more shinny and smooth after the process. The modern and advanced technology in this curling iron is gentle on your thus ensuring that you do not experience any kind of snagging or pulling during curling your hair. The ability of this tool to retain heat and heat up so fast makes it possible to create more defined and long lasting curls after curling your hair. 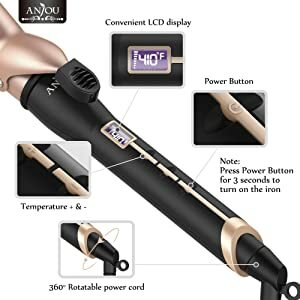 If you are not a pro or you just don’t have time when it comes to fixing and curling your hair but still want to achieve those elegant curls, stop wasting your money on traditional curling irons and get yourself this automatic curling iron! 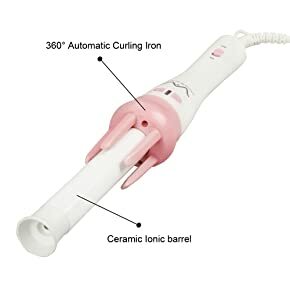 Unlike traditional curling irons which require tricks and techniques in order to achieve those elegant curls, this automatic curling iron doesn’t, all you need to do is position the curling iron close enough to your hair allowing it to touch the section of your hair, and then let it will automatically roll and curl that section of hair. As simple as that! 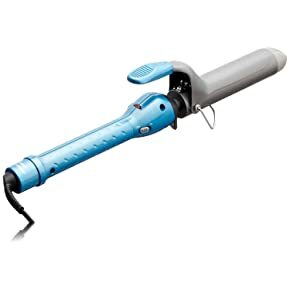 This curling iron can be used by medium and long hair, since it has a perfect sized barrel which allows medium and long hair to be fully wrapped on it, but it will not work that perfectly for extra short hair. 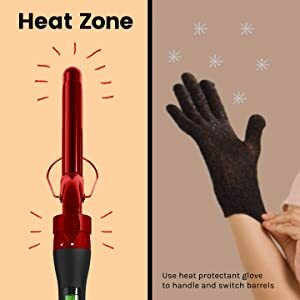 And you do not need to worry about burning your fingers, because once the section of hair has been rolled up, the tool will beep to let you know it’s time to release your hair, and also beeps when it reaches its full heat during the time of heating up. Not to forget the ceramic technology that has been encompassed in this tool which ensures smooth and shiny hair. It ensures safety during curling your hair with its’ beeping feature that alerts you when the tool heats up and when it’s time to release your after it has been rolled up. If you are looking to achieve both waves and more natural looking curls, then this curling iron is the perfect tool for you! Its size and tapered shape allows you achieve natural looking curls while making sure that your hair is highly protected from any heat damage due to its’ tourmaline ceramic technology. Its’ advanced and smooth finishes is gentle on your hair ensuring that you do not experience any snagging or pulling during the curling process. And more so this feature ensures that no creases are left after curling your hair. This curling tool is perfect for each length of hair, and it allows you to create bouncy and voluminous curls due to its size and shape. It works for all hair types, from thin to coarse or thick hair, due to its wide range of heat setting from the lowest to the highest. This tool is user friendly to people with thin or damaged hair because it ensures that your hair is not exposed to heat for a long time and also the heat setting can be adjusted to fit the needs of your hair. If you have short or medium length hair and you are looking to achieve those loose and smooth waves, then this tool is a must have for your hair styling routine. If you are running late but still want your hair to look all glamorous, then this tool will always come to your rescue because it heats up so fast and stays hot allowing you to achieve those waves within a few seconds. This curling iron is awesome especially for short hair since it has adjustable heat setting and a short sized barrel which works perfectly for short hair. The wide range of heat setting and the tourmaline ceramic technology is a perfect combination for fine, thin or damaged hair. The smooth finishes prevent any possible pulling and snagging during curling your hair. And not to forget the tourmaline ceramic technology prevents any heat damage on your hair, heats up so fast and stays hot throughout the session of curling your hair. Short life span, since some users complained of the tool dying after using it for some time. If you have short hair and you’re looking to achieve those tight curls, then you should definitely get this curling iron ASAP! 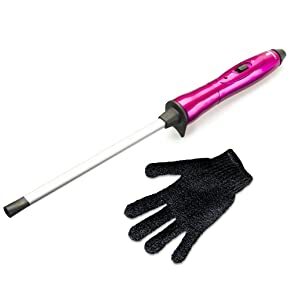 Although I wouldn’t recommend this curling iron for fine or thin hair because the heat cannot be adjusted, but if you have thick and coarse hair then this tool is perfect to manage your unruly hair. This because this tool gets really hot and stays hot allowing you to achieve more defined and long lasting curls. This curling iron is not limited only to people with short hair, it can also be used by people with medium and long hair especially if one wants to achieve tight curls or ringlets. 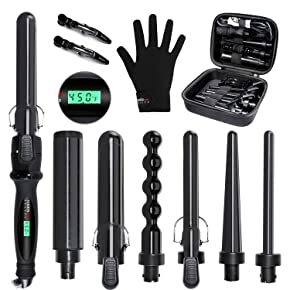 This curling iron set is perfect for anyone who wants to achieve different kinds of curls but doesn’t want to purchase different kinds of curling irons. This curling iron set allows you to have so many options when it comes to styling your hair, you can create tighter, medium or big curls whenever you want. With six interchangeable barrels which are different in size and coated with tourmaline ceramic technology, this curling iron not only allows you to achieve different styles but also ensures your hair stays healthy. 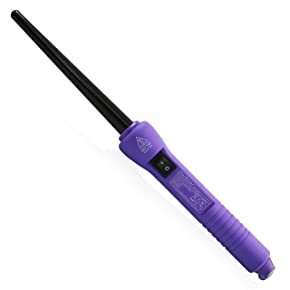 Although I wouldn’t recommend this curling iron for thin hair, because its lowest temperature is 3100 which might be a little bit high for thin or damaged hair. If you have lots of thick and coarse hair, then I bet you will fall in love with this tool. 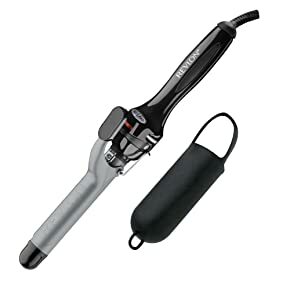 The heat setting of this curling iron can be adjusted to 4500 which is perfect to manage unruly hair. If you’re always busy and you rarely have the time to style your hair, then this the ideal curling iron for you especially if you have long hair. Its surface has been coated with tourmaline ceramic technology thus ensuring you achieve shinny and smooth curls. The advanced technology protects your hair from any heat damage and also eliminates frizz thus ensuring your hair stays healthy and elegant throughout. The perfect thing about this curling iron is that the size of its barrel allows you to achieve different looks, beachy waves, tight spirals and waves. When it comes to this curling iron you don’t have to worry about creases or kinks left on your hair after using the tool. 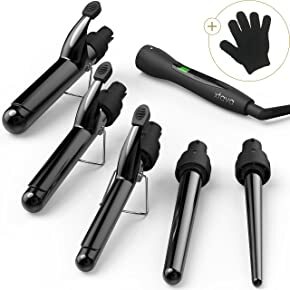 More so this tool has received great and positive reviews from most of the users, thus making it one of the best automatic curling irons on the market. If you are looking to achieve very tight spiral curls for your hair, then you should not spend your money on any other curling iron except this one! It doesn’t matter if you have short, medium or long hair, this curling iron guarantees you tight corkscrew curls within just a few seconds. The fact that it is more skinny and thin in size makes it possible for one to achieve very tight curls after using it. The most amazing part of this curling iron is its ability to heat so fast and stay extremely hot throughout the session which makes it perfect to manage extremely thick and coarse hair that is always resistant to curling. If you have damaged, fragile, thin or fine hair, then you need to choose a curling iron that not only has a wide range of heat settings but also has the lowest heat setting that won’t damage your hair, which is why this curling iron is perfect for you! 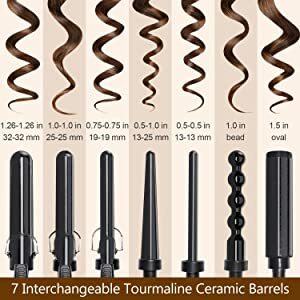 The interchangeable barrels which are different in size allows you to switch to any style that you want since you can choose to create tight, medium or large and bouncy curls by using different sizes of barrels available in this set of curling iron. What makes this curling iron the best for thin or damaged hair is the fact that it has a wide range of heat setting that allows one to adjust the heat at 1700 which is suitable for thin hair. But if you have thick and coarse hair then you can adjust the heat up to 4500 which the maximum heat. One of the fastest methods to achieve curls is by pulling your hair into a ponytail at the center of your head although you may also choose to divide your hair into two or three sections. Secure your ponytail or sections with a clip or elastic band. If you are using the ponytail method, divide your hair into four sections and start curling away from your head. Allow your curls to cool. Undo the ponytail and gently brush through your hair. Spray your hair with a hold hairspray for long lasting curls. If you want to create loose curls, then remember to hold your curling iron vertically. For tight and bouncy curls, always remember to hold your iron horizontally. For medium curls, hold your curling iron diagonally. To ensure you curls last longer, start by curling your hair from the roots to the ends and if you are beginner you may start off by curling your hair with your curling iron pointing down to make it much easier. Do not use cold water to force your curling iron to cool down, it will damage the springs of your tool. Picking the right curling iron for your hair can sometimes be challenging and confusing, but I hope after reading this article you shall be able to make a more informed decision and even after getting one for yourself remember to master the tips and tricks provided above to help you use the tool the right way. Pick nothing but the best, analyze the best 12 products reviewed above and make your pick ASAP!